A group of friends whose lives have diverged reunite in this sardonic, amusing novel. 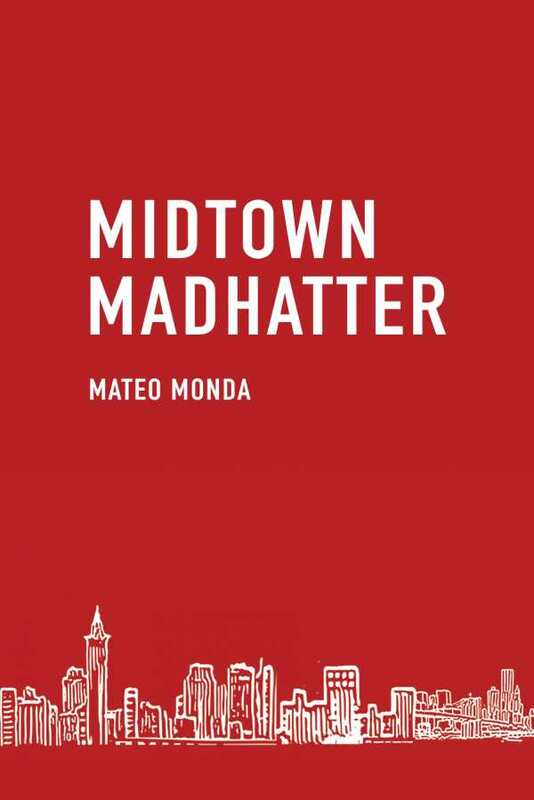 Mateo Monda’s novel Midtown Madhatter uncorks madcap humor while delving into weighty subjects like substance abuse and addiction. In the late 1990s, a wedding invitation draws Pete Walsh out from self-imposed exile in Guadalajara, Mexico, where he’s been seeking refuge after a heartbreak. The wedding, in midtown Manhattan, is a booze-soaked revelry that finds him reconnecting with childhood friends from Seattle. The book explores their relationships, divergent paths, and struggles and successes in life. Walsh narrates, and his well-honed comedic sensibilities animate the book. His perspective is wry and sardonic—he declares, for example, that he’s trying out a low calorie, high nicotine diet; an attorney is asked if she’s still a high-powered liar. He relishes the absurd. He dispenses keen observations on social interactions, wedding customs, and alcohol dependency—if his occasional bathroom humor is grating. Amid general profanities are off-putting slurs, including a homophobic slur that is thrown around in banter; it dates the work. The book’s tone varies. It is flippant, even boastful, when it comes to drinking and drugs, but it also pivots into dark territory, showing the horrifying depths to which addicts can sink and how substance abuse can take a toll on a family. Its delivery is casual and anecdotal but holds attention, with immersive details that bring to life the various settings and events, including the wedding ceremony that brought everyone back together. The pace moves in a brisk fashion as Walsh careens from one social encounter to the next over the course of a few days. He relates personal histories and chapters in his own past with pithiness, keeping the story’s momentum up. Too many characters and intricate social connections are introduced, though, and without enough context. The story gets easier to follow as it progresses and backstories are clarified. Walsh is the most fleshed-out character; his childhood friends blend into an amorphous, tippling mass to the point where they’re even quoted in unison. Major characters like Walsh’s wife, Elena, are more stock types, functioning as accessories in his tale. The much-trumpeted bond between the childhood pals who knew each other from kindergarten comes alive in some scenes, as when they break into a teacher’s apartment during a prank gone wrong, or when they roam the city sidewalks after getting kicked out of a bar. Still, their interactions are so rowdy and boisterous that their shared history gets lost in the mix. The comradeship that is the crux of the story sometimes registers as rose-colored. The book’s final epiphany is satisfying and packs an emotional punch. Midtown Madhatter is an often cheeky novel enlivened by the different trajectories of the lives of a group of friends.